The United Kingdom is one of the most popular tourist destinations in the world (especially since Brexit, with the pound having weakened, the country has become cheaper to visit). London is most travellers first choice destination and no doubt the most visited city. It draws people in with its charm, history, and of course centuries old traditional pubs. England’s smaller cities, like Bath, Oxford, Exeter, are just as equally fascinating with lots of culture and fewer crowds. Liverpool, birthplace of The Beatles, boasts a rich musical history. You have the beautiful peak, lake districts and Yorkshire dales in the north. The Scottish highlands with its mountains, lochs and glens. Giant’s Causeway in Northern Ireland. The Brecon Beacons, Snowdonia and the capital city of Cardiff in Wales. Stonehenge, Hadrian’s Wall. Don’t miss the stunning coastlines, beaches and the rolling hills of the moors in Cornwall and Devon. The countryside is fascinating and full of natural beauty. Once you get outside of London the prices drop dramatically. I personally think the best this country has to offer is outside of its capital. Airbnb is my preferred budget choice and cost from £20 a night for a private room, while entire apartments/homes can start around £40 a night. Get £30 off your first Airbnb trip of £55 or more click here. Bed & Breakfast, probably the most famous budget accommodation in the UK. These are usually private houses or farms and tend to be family ownership. Facilities can be simple (rooms may not have TV, no telephone or bathroom), but the best of them can be a home from home. Prices include breakfast. Some B&Bs won’t accept credit cards or travel vouchers, so I advise to bring cash with you. Budget hotels like Travelodge and Premier Inn offer the same amenities and start around £30 per night for a twin room. It’s best to book a month or more in advance. You can eat cheap in the UK if you know where to go. Fish & chips, full english breakfast & the Sunday roast with Yorkshire puddings and gravy are the traditional bites. Even a dirty kebab after a night out, these all just cost a few pounds. Indian or Asian food can be found for £6 at lunch times. A sit down meal at a restaurant with table will probably cost you from £25 for a main course. (Eating out at restaurants will soon put a dent in your wallet, so you’ll want to avoid doing so all the time.) Best places to buy and cook your own basic groceries are Sainsbury’s, Morrison’s, Lidl and Aldi. Tip: Summon a waiter by raising your hand. Don’t wave or shout. Tip: Try the many types of ale and cider. There is such a huge array of choices, flavours and they all differ from county to county. TIP: Many pubs offer a carvery for sunday lunch where your given a choice of one or sometimes even 3 different meats (typically chicken, beef or ham) and then you get to pile your plate with as many potatoes and veg as your eyes see fit. Tip: Put mint sauce on your roast to transform the flavour. Tip: When ordering a full English breakfast you can sk to substitute an item like the tomato or mushroom if you don’t like them for an extra sausage or rasher of bacon. It’s worth remembering that Britain is a relatively small country, so travelling to the many beautiful places is actually pretty easy. If you’re planning on visiting different areas of the UK there are a number of ways you can reach your destination. Bus, Megabus or National Express are the cheapest ways to travel around the country, where fares can start from as little as £1. Car rental can be arranged at major airports, large train stations and city centres. To get the best deals, do your research and book before you arrive in the UK, check out Rhinocarhire.com. You may prefer more leisurely forms of transport such as bike, canal boat or horse. Sometimes there are unusual picturesque local options, like arrive through the surf to Burgh Island on the sea tractor. Larger car ferries travel to Britain’s islands and there is always the option of flying by plane from far southerly to far northerly destinations. Taxis and Uber are available at all major coach and train stations. Tip: Don’t be insulted if someone calls you love, dearie, or darling. These are commonly used and not considered rude. Tip: “Please” and “Thank You” are very important in the UK. Say “Please” and “Thank You” to everyone for even the smallest kindness. Tip: Say “Pardon me” or “Excuse me” if you bump into someone or even get close to someone. The British also say this if they sneeze, cough or do not understand something someone has said. 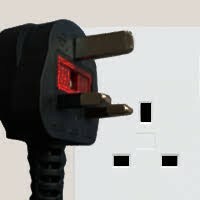 In UK power sockets are Type G: This socket has no alternative plugs. The voltage in Britain is 220/240 AC, 50 Hz. Electrical plugs have three rectangular pins and take fuses of 3, 5 and 13 amps. Visitors from abroad will need an adaptor for appliances that have been brought from home, such as laptops, hairdryers and phone chargers. Most hotels will have two-pronged European-style sockets for shavers only. The Mu Worldwide Traveller Duo is a superb addition for those who travel light and it stays in my travel bag all the time. It doesn’t matter where you go in the world this has you covered and will keep you charged up and ready to go with US and Euro plug adaptors and two USB ports. Public museums offer free admission in every city throughout United Kingdom. Eating in the UK can get quite expensive, but for good cheap meals, visit the local pubs. Eat out during lunch. Restaurants offer fabulous lunch specials where you can get multi-course meals for around £10 or 2 for 1 pizza specials. “Please” and “thank you” are very important in the United States. Say “please” and “thank you” to everyone for even the smallest kindness. Say “Pardon me” or “Excuse me” if you bump into someone or even get close to someone. Americans also say this if they sneeze or cough or do not understand something someone has said. Always hold the door for a person following behind you. Humor is ever-present in English life. It is often self-deprecating, ribbing, sarcastic, sexist or racist. Try not to take offense. Do not violate a queue. It is considered very rude to push ahead in a line. Summon a waiter by raising your hand. Don’t wave or shout. Don’t be insulted if someone calls you love, dearie, or darling. These are commonly used and not considered rude. It is considered rude to stare, ask questions or otherwise bring attention to someone’s disability. Holding the middle finger up by itself is considered insulting and vulgar. It is easier and cheaper to purchase a PAYG (pay as you go) SIM card locally and top it up with credit. This will allow you to use the local mobile-phone networks, though you can only do this if your handset is not locked to a specific network. Most of the time Wi-fi is freely available. If you’re staying in a hotel they may include Internet facilities as part of their service. Wi-fi is often available for free at libraries, many pubs, cafés and museums, so you can sit down and use your laptop, tablet or phone. Have you been to the UK? What’s your favourite place and time of year to visit?